(Cheltenham Jazz Festival, May 2nd 2015. Review by Jon Turney). 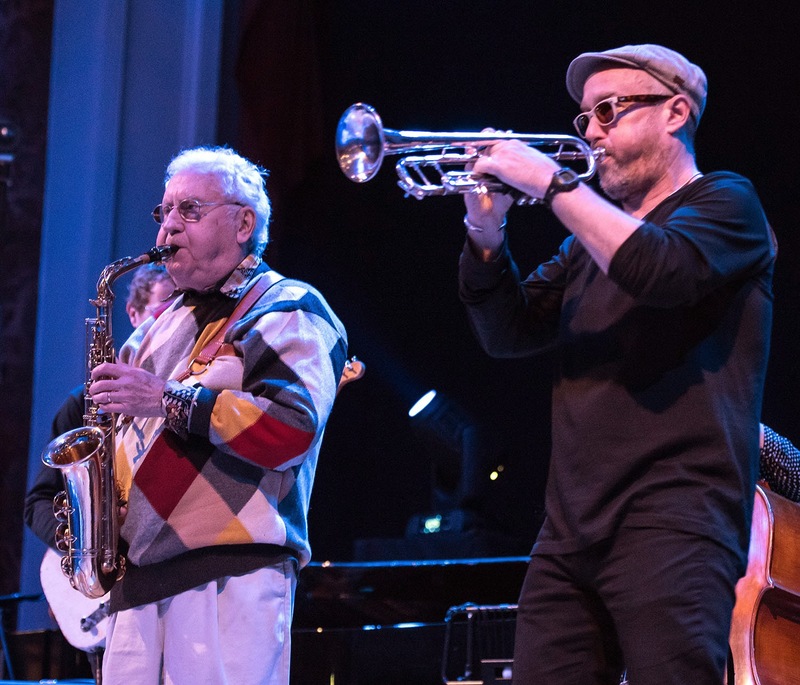 Dave Douglas and Joe Lovano have been working together of late, but as usual both are involved in several projects, and appeared at Cheltenham on the same day but in different bands. Douglas, on stage mid-afternoon in the Town Hall, shared the front line with the man directly in line to inherit the lifetime career title of greatest living improviser from Sonny Rollins when Sonny finally declares time is up. Konitz, at 87, might not be the greatest improviser any more, but still conveys a sense of mischievous spontaneity - keeping audience, and band, wondering: what he will do next? Sometimes that isn't surprising. Opening with All the Things You Are is pretty much expected on a Konitz gig. And there are rehearsed numbers, notably a fascinating recreation of Lennie Tristano's 317 E32nd Street where the two horns brought off the composer's fiendish line in flawless unison. Otherwise, they mainly played standards chosen on the fly. The band, with the exception of the marvellous Linda Oh on bass, played with considered restraint. That makes sense. In 2015 Konitz doesn't come to you: you come to him. It works well. Douglas is ever adaptable, and plays some softly spry trumpet solos. Jakob Bro delivers some of the most understated electric guitar you ever heard. Only Jorge Rossy on drums left one feeling a lack of bite. Konitz responds better these days to drummers who can goad the soloist a little - a Paul Motian or a Joey Baron - as well as coax them, which Rossy mostly does, very gently. The effect is rather of an agreeable gathering on the cool school porch, to hear what tales there are still to tell, or re- tell. And the great man himself? They don't always fall so readily under his fingers, but Konitz's long, twisting lines are still there in his head, as his frequent, drily attractive scatted vocals attest. With the alto in his hands, his solos sound at times like a man rummaging in a well-stocked but slightly disordered trunk of goodies. Not everything he brings out from this lucky dip holds the attention. But then, suddenly, he lays hold of a golden thread, unspools it, and it gleams. Those are moments worth waiting for. From cool to hot: Joe Lovano's set featured his homage to Fela Kuti, whom he met long ago. That meant torrential tenor solos built from slender materials over an Afrobeat pulse. In that setting, his playing was at its most Rollins-like - an impression reinforced by the guitar, electric bass, drums and percussion line-up the older man has used lately. It is a tremendous sound, and the band mainly avoids the monotony that is Afrobeat's possible pitfall. The remarkable percussionist Abdou Mboup adds talking drum, vocal and, just once, kora. Liberty Ellman on guitar had several impressively inventive excursions. Lovano is endlessly enjoyable on tenor and the rather beautiful tárogató, a clarinet/soprano sax hybrid. He returned to that horn on the final number of an intense 90 minute set, Coltrane's Spiritual. That felt right. This band takes Lovano on an excursion well worth making, but it ends by coming home to jazz.